Apple’s new ARKit has opened the door to new kinds of app experiences. My new app, Algebra Portal AR, creates virtual rooms filled with information about important terms and key concepts related to the Algebra I curriculum. What is really exciting about the Algebra Portal is students stand up, walk around and experience a totally immersive environment that is filled with illustrated examples that are used to explain some of the fundamental ideas of algebra. The floor Algebra Portal is a standard Cartesian plane with the x and y axes labelled. Teachers could develop lesson experiences that involve students walking into the portal and then moving to a specific (x, y) position to learn about a particular topic from the algebra curriculum. When a wall inside the Algebra Portal is tapped a menu of terms is displayed. If a term is selected detailed information about the topic is displayed with examples. Students and teachers will be amazed when they create virtual rooms filled with information about key terms and concepts from the middle school and high school algebra curriculum. Explore algebra in a new way with the Algebra Portal AR. Use the camera view on your iPad to detect a flat surface and then tap the screen. Instantly a portal opens to a world filled with information about the terms and concepts that are part of the algebra curriculum. In an nutshell, to use the app, students walk around in the augmented reality algebra portal where they can tap on the walls and other objects in the rooms to get more information and to hear Siri read aloud information about the selected item. Students can scroll through an extensive list of terms related to the information on the walls of the rooms, walls and objects in the portal. Algebra Portal AR creates virtual rooms that are approximately 4 meters by 7 meters. It is best used in a well-lit open space, perhaps in a school’s auditorium or multi-purpose room. If the Algebra Portal sounds interesting to you, you might also like the Geometry Portal AR. Algebra Portal AR is available with a volume discount for educational institutions. Algebra Portal AR can be purchased worldwide exclusively through the Apple App Store. It also available through Apple’s volume purchase program. Schools get a significant discount when purchasing multiple copies of Algebra Portal AR. Contact Apple Education for more information about the volume purchase program. Please visit Ventura Educational Systems’ website for more information about this and other iOS and tvOS apps for education. Kids love to play Hide and Seek. Hide and Seek AR is similar to the popular game with a new twist: The players use the app to hide and find geometric shapes in an augmented reality environment. Hide and Seek AR is a two player game. The game begins when the first player closes his or her eyes while the second player uses the iPad to hide three geometric figures in the augmented reality environment. When three shapes have been hidden, the first player passes the iPad to the second player whose task is to find the objects before time’s up (3 minutes). It’s a great way to introduce elementary age students to the names of geometric figures. Both 2D shapes and 3D solids are used in the game. Synthetic speech is also used so students can hear directions and also the names of the geometric figures. A list of geometric figures is shown at the bottom of the screen. Students can scroll through the list by swiping left or right. A variety of shapes are available in different colors. Students can place a shape in the Augmented Reality by tapping places on the screen. The virtual objects ‘magically appear’ and can be viewed from various angles by walking up to and around the object. Hide and Seek AR is easy to use. Buttons are used to control most of the activity. The app would be appropriate for most elementary age students. Hide and Seek AR is available with a volume discount for educational institutions. Hide and Seek AR can be purchased worldwide exclusively through the Apple App Store. It also available through Apple’s volume purchase program. Schools get a significant discount when purchasing multiple copies of Hide and Seek AR. Contact Apple Education for more information about the volume purchase program. Please visit Ventura Educational Systems’ website for more information about this and other iOS and tvOS apps for education. Molecules AR creates an Augmented Reality experience for view atoms and molecules in 3D. While using the app students can tap icons to display the hydrogen, carbon, nitrogen or oxygen atom. Protons, neutrons and electrons appear about 1 meter in front of the iPad came and can be experienced by moving forward, backward or around the virtual image. To learn more about the atomic structure, students can tap the notebook icon to display information about the composition of the selected atom. Once selected a 3D model of the atom or molecule appears about 1 meter in front of the camera in the augmented reality viewer. The model can be rotated on its x, y or z axis. In addition students can walk up to the molecule and view it from different perspectives. Molecules AR is available with a volume discount for educational institutions. Molecules AR can be purchased worldwide exclusively through the Apple App Store. It also available through Apple’s volume purchase program. Schools get a significant discount when purchasing multiple copies of Molecules AR. Contact Apple Education for more information about the volume purchase program. Please visit Ventura Educational Systems’website for more information about this and other iOS and tvOS apps for education. With the release of iOS 11 Apple introduced several new exciting tools for developers. One of them is a new framework called the ARKit. ARKit is a set of tools that allow developers to create augmented reality experiences for iPhone and iPad. 3D digital objects and other information can be combined with the immediate environment. Learning how to use this set of tools enabled me to create several new apps for iPad. The first project is titled Solar System AR. 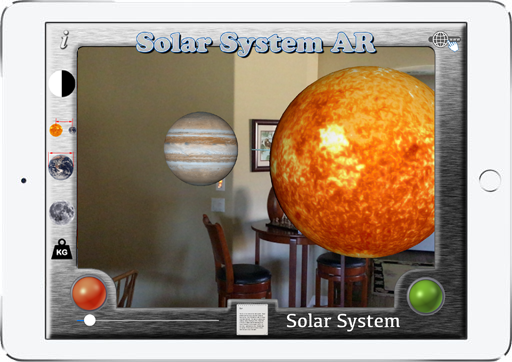 Once the app is launched, Solar System AR brings a 3D model of the Solar System right into a classroom or living room. The sun and planets all rotate. The planets revolve around the sun and the earth’s moon is shown revolving around the earth. In addition, any planet can be selected using the slider. Once selected, the planet appears in the augmented view. Detailed information about each planet is displayed icons on the left side of the screen are tapped. The length of a day on any planet is shown when this icon is tapped. Students can find out a planet’s distance from the sun by tapping this icon. Tapping this icon results in a table showing the dimensions of the planets in miles and kilometers. A table showing the mass of each planet is shown when this icon is tapped. Below is an example of one of the tables. General information about the Solar System and specific information about each planet is available for students to read. The Augmented Reality component of this app makes it very exciting for kids. It is kind of a magical experience to have the Solar System appear in the immediate environment. Students can walk around the room and move up close to any of the planets as they orbit the Sun. Using the slider students can select any planet to study more closely. Launch your students into the technology of the future by introducing them to the Solar System using Augmented Reality. The Solar System AR is available with a volume discount for educational institutions. The Solar System AR can be purchased worldwide exclusively through the Apple App Store. It also available through Apple’s volume purchase program. Schools get a significant discount when purchasing multiple copies of The Solar System AR. Contact Apple Education for more information about the volume purchase program. Please visit Ventura Educational Systems’ website for more information about this and other iOS and tvOS apps for education. It is great fun when you have precocious grandchildren who have creative and inventive minds. One of my grandkids is really into word search puzzles. He loves finding the names of states, or capitals, or astronomy words, or anything else that might be the theme of a word search puzzle. But the gears in that creative mind started spinning one day and he created a search type of puzzle with numbers. The gist of the idea was to write an array of random numbers on graph paper and then pick a random target number and try to find numbers in the array that add up to the target number. This concept gave birth to an iOS and tvOS app named Target 10. The screen above shows the main game board for Target 10. The object of Target 10 is to earn 10 stars by finding sets of numbers in the grid that add up to the target number. Target 10 offers four levels. On an iPad simply tap the Settings icon and then from a screen similar to the one show below, choose a level. If you are using Apple TV you swipe to get to the Settings Icon and then swipe and click to choose a level. Automatically a new puzzle is generated at the level you selected. Study the puzzle to find chains of numbers that add up to the target number. There’s a fun little twist. The position of any two numbers can be switched. When you can’t find any more sets of numbers to make the target sum, try using the Switch icon to move numbers. To do a switch tap the Switch icon and then navigate to the two numbers whose positions you want to switch. If you are still stuck, you can tap the New Board icon for a new grid. Continue finding sets of numbers that add up to the target number until you have earned 10 stars. In designing this app I wanted to motivate elementary age students to get quicker at mental math. It is my intention that by using Target 10 on your iOS device or Apple TV you will be able to engage students problem solving and strategic thinking activities that they will enjoy. The tvOS version of Target 10 offers the same great features as the iOS version, and additionally can be controlled using tvOS compatible game controllers so maybe the kids will think they are playing a video game. Target 10 is available with a volume discount for educational institutions. Target 10 is available worldwide exclusively through the Apple App Store. It also available through Apple’s volume purchase program. Schools get a significant discount when purchasing multiple copies of Target 10. Contact Apple Education for more information about the volume purchase program. Please visit Ventura Educational Systems’ website for more information about this and other iOS and tvOS apps for education.